Management systems need feedback to keep them on track, and internal audits are their key feedback mechanism. Not surprisingly, they are a mandatory requirement of standards like ISO 9001 (Quality), ISO 14001 (Environment), OHS45001 (Health and Safety), and ISO 27001 Information Security. Internal audits can help your organisation maintain compliance, demonstrate due diligence, and achieve real business objectives. 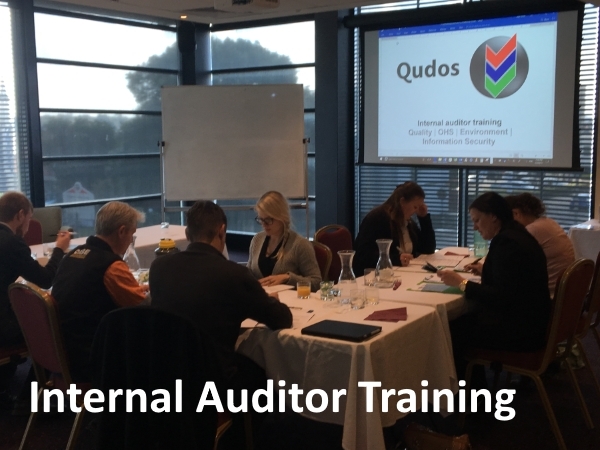 With its practical, risk-based approach, Qudos internal auditor training will help you to get better outcomes from your internal audits, and make smarter use of your resources. Our unique format of 1 day on-site training + online resources saves you time and money! 1 day training session + Online resource pack. Suitable for new and existing internal auditors of management systems based on one or more of the following standards: ISO 9001 Quality, ISO 14001 Environment, the recently released ISO 45001 OHS, and ISO 27001 Information Security. Practical training includes working through case studies, scheduling a risk-based audit programme, reviewing a procedure and preparing an audit checklist for it, planning, performing and recording an internal audit. We can facilitate a training session to be held at your own premises - saving time and money, and enabling the practical aspects of the training to include real audits of your own management system. This service is available in Australia, Asia-Pacific, and Gulf states. For Locations and Dates refer to our 'Upcoming Events' or for Private courses Email us.